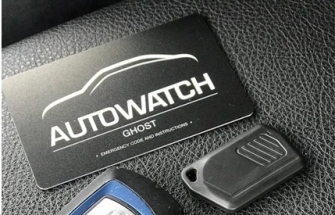 The Autowatch Ghost ADR is fantastic if your looking for excellent security but don't want the hassle of having to enter a pin number each time you enter the vehicle the Autowatch ADR will be the product for you. The ADR part is the tag which sits on the vehicles key ring, this allows you to simply start and drive the vehicle providing the ADR tag is within range. If in the event of the battery going flat within the ADR tag the vehicle can be started by entering a pin code via the vehicles dash or steering wheel buttons as per a normal ghost this would allow you to start the vehicle if required. The Ghost is a product which immobilises the vehicle via can-bus which is a form of blocking on the vehicles data lines. The Ghost is a completely invisable immobiliser once installed meaning a thief wouldn't know it's fitted to your vehicle. The Ghost is so small it would take many hours of stripping apart every vehicle loom in order to find the device. If you would like an Autowatch Ghost ADR installed why not give us a call on 07525 068291.